Whispers in the Loggia: For Gotham, "The Search is On"
As foreseen some weeks ago, the fountain of honor has been poured out on the Big Apple and then some -- papal honors for 44 layfolk, elder brethren and permanent deacons were conferred by Cardinal Edward Egan at a Monday night Vespers in Midtown. Given both in tribute to the honorees' work invested in April's papal visit and the wider mission of the 2 million-member archdiocese, the gongs are but the latest progression in the swan-song leading up to a forecast springtime acceptance of Egan's retirement and the appointment of his successor -- the first transfer of governance from one living archbishop to another the 200 year-old see has ever experienced. Only in recent weeks have the US church's upper ranks been consulted on the all-important, eagerly-awaited appointment, a development indicating that only now are its run-up's final days on these shores at hand. As one figure well-appraised of the situation put it earlier this week, "The search is on" -- in Washington, that is, where the papal nuncio Archbishop Pietro Sambi will finalize his terna of three names, the centerpiece of an extensive report on the state of the church in the "capital of the world" that'll head to the Vatican's Congregation for Bishops, whose 30-odd members (among them, four Americans) would then vote on a single candidate to recommend to Pope Benedict. While no shortage of prospects have been floated about since even before Egan reached the retirement age of 75 in April 2007 -- so many that, as one senior prelate remarked, "it's like hearing [nothing] at all" -- from DC and Rome to the innermost reaches of Egan's small, trusted circle, a new entry in the stakes is attracting widespread interest: the Cleveland-born archbishop for the Military Services, Timothy Broglio. 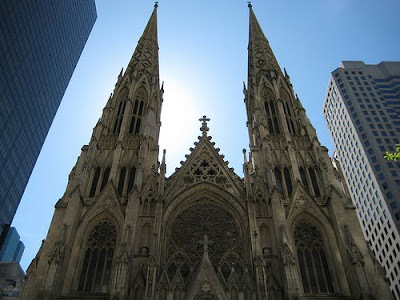 Among other trade-offs -- and, indeed, the considerations are legion -- the coming appointment will need to balance the Gotham church's present and future as a majority-Hispanic flock with the still-influential thread of its Irish-dominant tradition. 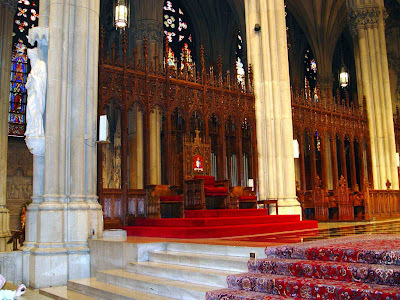 Not since 1842 has a prelate of non-Irish descent reigned on Manhattan; further underscoring the point, when the archdiocese celebrated its centenary in 1908, then-Archbishop John Farley deferred the presiding honors at the festivities to the archbishop of Armagh and primate of All Ireland (i.e. the successor of St Patrick, himself) Cardinal Michael Logue. The new hot name's selling point: prior to his surprise appointment a year ago as shepherd-in-chief of the nation's 1.4 million Catholic servicemen and women, Broglio served seven years as a beloved, pastorally-savvy nuncio in the Dominican Republic and papal delegate to Puerto Rico, giving the 56 year-old prelate (right, aboard the USS Iwo Jima) a cultural fluency with Latinos almost- unique among the small handful of Anglo prelates suitably prepared for the "prime-time" onslaught of expectations that come with the keys to 452 Madison and Stateside Catholicism's most visible, powerful post. 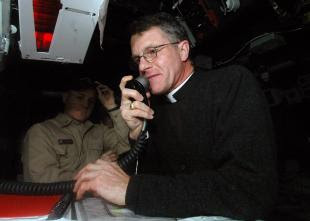 Including his assignment to Santo Domingo, the double-Jesuit BC alum in the classics spent 24 years in Vatican diplomacy, nearly half of those as chief of staff to the then-Secretary of State Cardinal Angelo Sodano whilst concurrently serving as the Curial clearinghouse's desk chief for Central America. Regarded as bright and smooth, with a dry sense of humor and a Roman sense of perspective, Broglio's first year at AMS has been widely regarded as a success, and he's said to enjoy Sambi's high regard. But all that said, folks, remember well that this ain't, say, Wichita. Every appointment may be made in the Pope's name -- and, indeed, this pontiff puts significantly more time and energy into his climactic part of the process... yet regardless of who's occupying Peter's chair at the moments in history when its file comes up, an archbishop of New York is chosen by none other than The Pope Himself. It might've been John Paul II who famously said "I want a man like me" in the slot... but every bishop of Rome faced with the choice over recent decades has felt something of the sort. Ergo, until that final word falls from above, reports like these are to be taken as nothing more than trackers along the way. Earlier today, Egan presided at the biannual meeting of the board of trustees at St Joseph's Seminary, Dunwoodie. The cardinal reportedly kept the gathering brief... quite possibly to catch tonight's presentation of Berlioz's Damnation de Faust at his beloved Met.